NES Palamedes II: Star Twinkles (JPN) "Quest Mode 1" in 03:40.27 by mcwave. Palamedes II can be described as "its predecessor, turned upside down". As before, your goal is to rearrange a set of dice and put them in a row for elimination. Only series of dice such as 4-4-4-4-4 or 1-2-3-4-5 can be eliminated, and depending on the series, this will result in one or several rows of dice to be eliminated from the screen. Unlike the original Palamedes, this time your character stands on top of the dice, and the growing pile of dice will crush him unless he makes the correct combinations to eliminate the pile. It's a bit like Tetris, and a bit like Klax. Two modes are available. 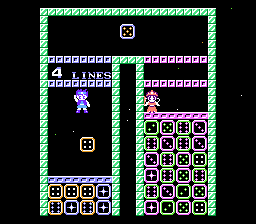 Mode 1, that this run uses, puts your player on top of a growing pile which must be eliminated.